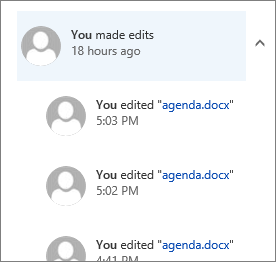 SharePoint keeps track of changes and updates of files in your library. You can see the changes that were made (created, edited, deleted) and when (18 hours ago, yesterday, last week). You can view only activity on individual files and documents, or your whole library. Open the document library and clear all check marks so no files are selected. Click Open the details pane . Scroll down to Recent Activity to view the latest activities for your files. If an activity has a down arrow next to it, click the arrow to view details about that activity. For example, if you made several edits, you'll see when each was made. To close the details pane, click the Open the details pane icon again. 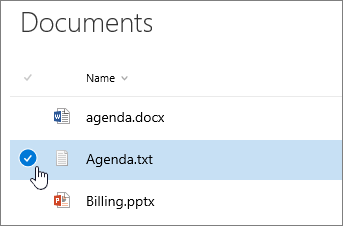 Open the document library and hover over the file whose activity you want to see, and click the check mark. Scroll down to Recent Activity to see the latest updates on your file. If an activity has a down arrow next to it, click it to view details about that activity. For example, if you made several edits, you'll see when each edit was made. To close the details pane, click Open the details pane again . If you're editing and checking in files, take a look at versioning. With versioning you can see each version of a file that's checked in, and view or restore earlier copies. 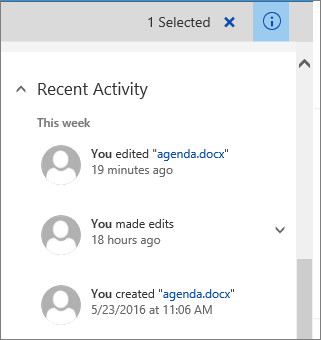 See View the version history for a file in a SharePoint document library for more info. To keep others from editing or changing a document, check it out while you're working on it. See Check out or check in files in a document library for more information. Was this article helpful? If so, please let us know at the bottom of this page. If it wasn't helpful, let us know what was confusing or missing. Please include your version of SharePoint, OS, and browser. We'll use your feedback to check the facts, add info, and update this article.